A panorama of the Tabo monastery compound. Situated at an altitude of 3500 metres on a plain just above the north bank of the Spiti River in the eastern region of Spiti lies the small village of Tabo. A little south of the town the well tended temple complex of Tabo Chokhor is found. Its structure blends well into the surrounding village of brown and white mud- and stone buildings. The monastic complex of Tabo (Ta-pho) is the first large religious site found in the barren and desolate moonscape of Spiti, between the Great Himalayan Range and the Zanskar Range, three days drive on hazardous roads from any larger Indian city like Shimla or Manali. Built in 996 AD under the patronage of the Western Tibetan king Khorre (c. 9671040), who had renounced his throne to become the famous monk Yeshe O, and spiritually conceived by the Great Translator, Lotsava Rinchen Zangpo (9581055), the Tabo Chokhor complex is one of the few surviving monasteries of the earliest period of Tibetan monastic culture and art, and certainly one of the most beautiful and elaborate of its kind. The story of Tabo opens a window both on Tibetan and on Indian culture and history, because of a religion and a style of art that have both disappeared from their land of origin. Inside its temples one can find extraordinary examples of early Indo-Tibetan art. Pala influence may be well observed in the wall paintings of Tabo, together with the second main influence on the art of Tabo  Kashmir, at the time one of the few remaining Buddhist realms in mainland India. When it was founded the Tabo Chokhor monastic complex was built according to the concept of the mandala, in its outer as well as its inner structure, taking into account the Buddhist philosophy of macrocosm equalling microcosm. The main temple, Tsug Lhakang was at the centre of the whole complex. The centre of this temple was also the centre of the compound along the eastwest axis, having its major statue, Saravid Vairochana, placed in the central spot not only of its surrounding 32 statues in a perfect three-dimensional mandala around him  and therefore of the temple  but also of the whole complex. Entering Tsug Lhakang one is deeply awestruck by the peaceful and serene atmosphere that this temple of worship offers. One cannot hold back the impression that divinity is present. This is due to the unified and harmonious design of the big room with its multicoloured clay figures, its murals in dominating mineral colours of red and blue and its highly skilfully executed religious paintings of Buddhas and Boddhisattvas. The feeling grows that 1000 years of spiritual power conceived in peaceful meditation still permeates the room´s atmosphere. The 33 deities of the cycle of Tabo´s Vajradhatu Mandala are nothing other than symbols of special moments in the meditation process. 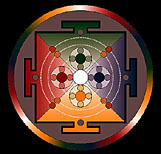 The fivefold mandala expresses a particular system of cosmic evolution. Its background stages to be undertaken are called reabsorption. This reabsorption into the cosmic Buddhahood is reached little by little in five stages through eliminating in a final manner the dimness which is caused by the passions and ignorance. Only by attaining the virtue of the intimate essence symbolized by the deities is regeneration and sublimation possible. It is the pure germinal luminosity symbolized by the silver (white) Vairochana, “the Refulgent” being the fourfold Saravid Vairochana at Tabo, “the Omnipresent One”  the centre of the mandala  from which everything stems, detaching itself more and more, materializing itself and finally becoming dim. 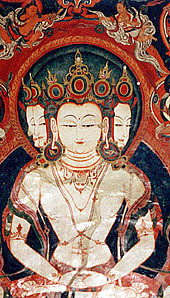 The Supreme Buddhas, the Dhyanibuddhas or Tathagatas surrounding Vairochana are depicted in the four pure colours: red (Amitabha), yellow (Ratnasambhava), green (Amoghasiddhi) and blue (Akshobhya), meaning the first stage of cosmic attachment and materialization in psychological as well as physiological terms, in fact symbolically expressing the lines of cosmic evolution. Each one of these four Dhyanibuddhas has four Boddhisattvas surrounding him, each symbolizing one of the sixteen species of insubstantiality. In realizing these insubstantialities the spiritual seeker discovers the truth that nosubjective or objective perception  whether sensual, psychological, physical, believing or knowing  is of absolute truth. Only in this all negating manner may truth and insight into the cosmic laws, and therefore the possibility of leaving the everturning cycle of birth and rebirth, the attainment of enlightenment, the state of Nirvana, be obtained. The strength necessary for this spiritual undertaking is symbolized by another set of twelve deities in the Vajradhatu Mandala, representing the eight perfections and powers like faith, knowledge, consciousness and concentration. The afore-mentioned fivefoldness finds its expression in the structure of the mandala, which consists of five levels. The Vajradhatu Mandala and its three-dimensional arrangement of deities at Tabo´s Tsug Lhakang. Entering Tsug Lhakang one is deeply awestruck by the huge number of statues and paintings visible, waiting to be explored. Every little niche and corner, including the wooden beams of the ceiling, seems to be painted. But painting at Tabo followed an exact layout-plan, as did the layout of the Vajradhatu Mandala, and the impression one gets after adjusting to this vastness is that of order and supernatural beauty. Unfortunately many of the paintings, especially in the lower register, are badly damaged. In fact the northern wall has a large area where nothing except for the grey wall can be made out. Thematically the walls can be divided into three parts: lower, middle and upper. The main part of the lower register, next to inscriptions and historical themes, is taken by narrative friezes depicting two Buddhist legends: On the left part of the western wall, on the southern wall and on the left part of the eastern wall it is the Legend of Prince Sudhana, who gained wisdom at 52 different places and phases of his life and was finally enlightened. On the right part of the eastern wall, on the northern wall and on the right part of the western wall it is the Legend of Prince Siddharta. The middle register as well as being the space for the clay sculptures of the Vajradhatu Mandala, shows symbols and female deities also connected with this concept. The upper register, finally, depicts the celestial abodes of Buddhas and Boddhisattvas, as well as circles of Tantric deities and Bon goddesses. 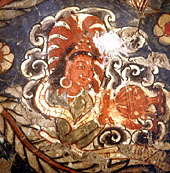 Detail from the narrative friese on the southern and western walls at the Tsug Lhakang of Tabo. Rain Goddess Nanda spilling out her water from an elaborate vase onto Prince Siddharta. 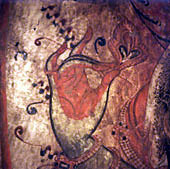 Detail from the narrative frieze at Tabo´s Tsug Lhakang. In the estern rear of the Tsug Lhakang lies its sanctum sanctorum, the apse or cella. Here are located probably the most beautiful Buddha and Boddhisattva depictions of all Tabo. The beautifully preserved colours and details of the paintings show the original state of execution of 1042. 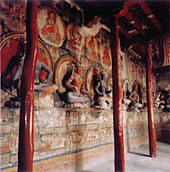 The depictions of the Boddhisattvas on the outer walls of the ambulatory lead to the realisation of what makes Tabo´s Tsug Lhakang such a unique and beautiful place apart from its aesthetic and philosophical conception as a whole. It is the extraordinary fineness by which each and every little detail has been executed, be it the delicately painted scarf of a divinity or the splendid intricacy of a stucco crown. It is all accomplished by the use of fine line, clearly articulated forms and brilliant, tastefully applied primary colours, together with tremendous imaginative and visionary abilities and that the deep sensitivity of the artists for the iconographic details “dictated” by the scriptures. It is said that a layer of gold-dust as thick as a yak´s skin coated the inner surface of Serkhang´s walls. If there is any truth in that, then only fine traces remain today, but art-historically and aesthetically speaking this temple definitely deserves its name. The temple contains a huge number of most beautiful murals almost 4 metres high. They were executed during the second great patronage of Buddhism in Guge under the king Senge Namgyal of Ladakh in the 16th century. 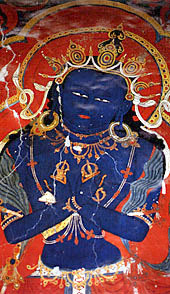 Although Chinese influence from Central Tibet was already dominating Tibetan art at that time, Indian influence still dominates the paintings of Serkhang. 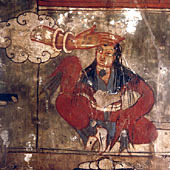 What is seen today might be overpainted versions of 12th to 13th century murals, since Serkhang dates back almost to the foundation of Tsug Lhakang. The style of the paintings are is generally accepted as the “Guge style”, a distinctive style that developed there in the mid-15th century and spread as far west as Karsha in Zanskar. It has been characterized as a blend of Kashmiri tendencies and features from Nepali and Chinese traditions, but being influenced most by the Sakya-pa style that came from Central Tibet. This is apparent in the way the themes depicted have been treated: every main deity is surrounded by its lineage, the family circle that belongs to it. Lineage depictions were not known in the Kashmiri paintings of the early period. Although red always dominates (e.g. 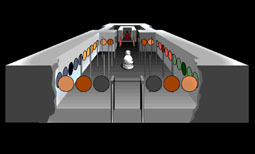 in the palaces and haloes) it is structured by ornamental lining in darker red and counterbalanced by glowing blue, green and yellow. The paintings bear a close resemblance to the paintings of the red and white temples of Tsaparang, which have been related to the “Second Golden Age of Guge” between the 16th and the 17th centuries. 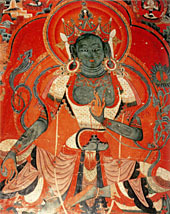 As the central figure of the right wall is the most beautiful painting of Green Tara in Varada-mudra, her left hand holding a lotus that blossoms at the height of her shoulder. This Tara shows an exquisite application of shading techniques which bring the grey-green colour of her skin practically to life. The hourglass shape of her body enhances the width of her bosom revealed at the decolletage of her almost folkloristic looking dress. The crown she wears is again a masterpiece of stylized creativity. The right wall´s left figure is the white, four-headed Saravid Vairochana. His heads are topped by beautiful threefold crowns and elephants, lions and small, childish-looking figures. The columns of his palace look like rays of light that end in two burning wishing jewels, topped by two Apsaras on clouds paying their homage to him. In the small medallions which encircle the figure the complete mystical circle of Saravid Vairochana is present. It consists of 36 deities, including the four Supreme Boddhisattvas associated with Vairochana. This magnificent painting is executed with wonderful precision and a surprising richness of detail. For the later schools of Tibetan Buddhism, Vajradhara is the Adibuddha per se. He is the original, the essential Buddha, the manifestation of the highest degree of wisdom, a level that was taken by Vairochana in the 11th century. His attributes are the symbols of bell and thunderbolt crossed before his chest as an expression of the unification of the principles of absolute truth and compassion for all beings as the method for attaining the highest wisdom. His colour is blue because he is all-containing and unshakeable like the sky. Vajradhara´s throne is supported by two elephants. Behind the throne a red “halo-palace” unfolds, its boundaries marked by columns carried by little naked figures. Peacocks roam on the balconies. The Adibuddha is adorned with heavy jewellery and a highly stylized fivefold crown. He is surrounded by the 84 Siddhas, the ascetics who continuously renew and interpret the experiences of the mystical revelation they have of Vajradhara as the Supreme Truth. "Forgotten Gods of Tibet" by Peter van Ham and Aglaja Stirn (also available in German and French). Additional views are contained in the books "Buddha´s Mountain Desert" and "On the Paths of the Buddha" (both in German language). There is also one audio CD out, entitled "Tabo - Mandala in Stone" containig music inspired by the trips to Tabo.